Teaching a newbie how to program is a difficult task, whether you’re writing a book, recording a screencast or teaching a class. Similarly, it’s a bit of a hassle for someone who is proficient with one or two languages to pick up a new one. 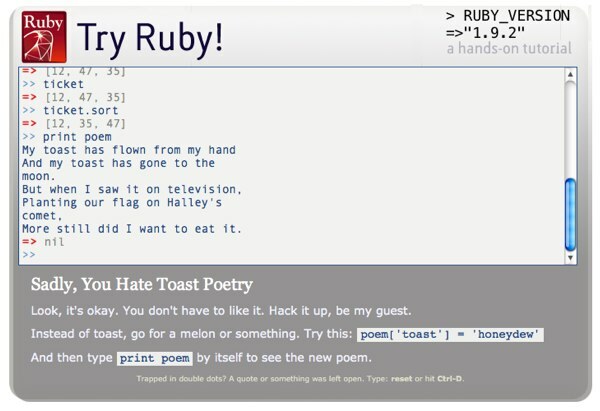 Try Ruby is a clever interactive tutorial that would work well for either scenario. It takes the form of an in-browser command line Ruby interpreter with a pane along the bottom that gives you instructions. It tells you to type in a command, and explains what exactly is going on. Doesn’t that make you want to learn Ruby? I went through a few steps, from basic arithmetic to strings to arrays, and it was kind of fun. Having to type out everything as you go seems to reinforce your understanding of what you’re doing better than simply reading a book. And once you’ve got the language down, you should be able to move on to watching screencasts for the Rails framework. I may have to give Ruby a try sometime. Here’s a fun Stack Overflow thread from last year: What is the best comment in source code you have ever encountered? It’s a fun read if you’re into programming at all. The thread has since been locked, so if you have any to add you can post them here. Have you ever wanted to learn how to write your own iPhone applications? It’s certainly more difficult than web development, but the device is a good platform to learn client-side programming with. Mobile applications that tie into web services are becoming increasingly common, so now is a good time to give it a try. iPhone Application Development For Dummies is a good primer on building applications for the iPhone or iPod Touch. It covers the basic theory over the first few chapters, and then moves on to building a simple View-based application. I haven’t finished the book quite yet, as I’m working my way through the tutorials as I read, but the book seems to cover all of the basics quite well. There are parts on data storage, input events, and many other things that are critical to iPhone development. I’m finding the book to be a bit challenging, as I don’t have any real desktop programming experience, other than BASIC if that counts. I don’t think I’d recommend it to someone who doesn’t have a strong grasp of at least one programming language with a C-style syntax, such as PHP or Java. Knowledge of object-oriented programming is important, in addition to more basic skills such as dealing with variables and control structures. If you’re a total programming newbie, I would recommend reading a good introductory book first, and then moving on to iPhone Application Development for Dummies. I’ve enjoyed what I’ve read of the book so far, and I hope that, by the time I’m done, I’ll have a good enough grasp of things to develop an idea I’ve had for awhile into an app. Scott Gilbertson of Webmonkey’s MonkeyBites blog has an interesting post about the Twitter API, more specifically, on how some blog software providers are “borrowing” Twitter’s programmer interface to enable clients such as Tweetie to update your blog. Twitter’s API has spawned hundreds of mashups and third party software apps, but now it’s growing even further — outside sites have begun mimicking an API to piggyback on Twitter clients. It started last week with a clever hack by WordPress contributors which allows WordPress.com users to post and read their WordPress.com blogs through third-party Twitter apps like Tweetie 2 for the iPhone. Now Tumblr has joined in on the fun, allowing you to post and read Tumblr blogs through any third-party Twitter app that allows you to change the API endpoint. While that’s interesting, I don’t really like it. Emulating another service’s API will only result in problems as Twitter updates their API methods. Developers of Twitter clients will update their software, and companies like WordPress.com will have to be quick to re-work their fake Twitter API, otherwise things could break. It just seems like a bad plan to base something like that off of a third party’s proprietary framework, rather than that of an open standard. Stackoverflow is sort of like the anti-experts-exchange (minus the nausea-inducing sleaze and quasi-legal search engine gaming) meets wikipedia meets programming reddit. It is by programmers, for programmers, with the ultimate intent of collectively increasing the sum total of good programming knowledge in the world. I couldn’t have said it better myself. It’s sort of like Reddit or Digg, but centered around answering everyone’s questions instead of sharing links. If you want to know the best way to go about doing something in PHP or Python, pose your question on Stack Overflow and watch as you receive at least one thoughtful answer within the half hour.